I was initially skeptical of the owl found on the Create a Critter cartridge on p. 25. Shown in colors very similar to the one I did, I wasn't sure whether it worked or not. I like it! The suggested colors went well with my K&Co papers and I even used the branch and "hoot." The owl is cut at 2" and the branch at 2 3/4 ". I popped the bird up slightly using foam tape (that was the only thing I elevated). 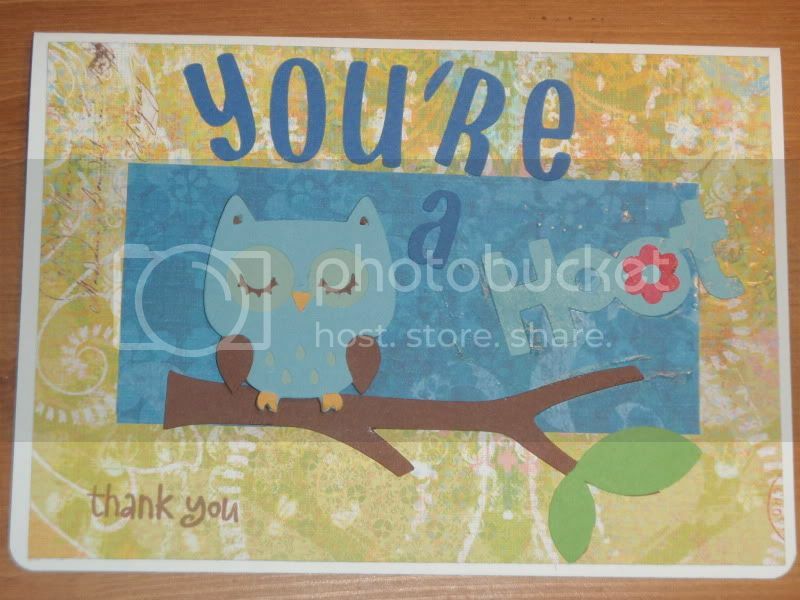 The stamped greeting is from a Hero Arts collection using chestnut roan Colorbox ink. I cut the "You're" at 1.25" using the Don Juan cartridge and the "a" is at 3/4". Since I'm sending it to a friend, rather than donating it, I used a 5x7" card base. Hope she likes it.